The Natural Cottage - Contact Us - All Natural Homemade Soaps, Lotions, Detergents, Body Butters, Fizzies, Crafts and More! TheNaturalCottage.com - All natural soaps, lotions, gifts and luxurious bath aids. Creating Beauty from Nature's Bounty, one item at a time. All our products are made with only the finest pure natural oils, butters, salts and essential oils. You benefit from all natural homemade soaps with no chemicals that can harm your skin or body. We take great care in creating each bar or item. Using only natural oils, butters and essential oils our homemade soaps are the finest that we can make them for you. Join our happy family of satisfied customers today and feel great. I have moved to Livonia now to have more space to create the Natural Cottage products. The same philosophy has moved with me to the new location. Because we are a family run cottage industry, each of our products are made in small batches. Attention to the finest ingredients and fragrances goes into each item we make. Perfection is hard to accomplish but that is our goal with each and every product that we sell. We can only reach perfection in your eyes if you let us know if you have special needs or wish a batch done in your favorite fragrance. Allow us to exceed your expectations. Please feel free to contact us with any questions and comments. We wish to make your experience at The Natural Cottage a special experience for you. Please let us know any special requests you may have, you could have a product named after you! 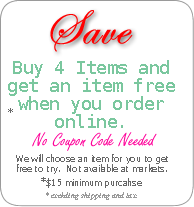 Every item that you purchase from The Natural Cottage is made to be the best you will ever purchase. Our guarantee to you is just that. If you ever purchase an item you are just not happy with, please ContactUs and we will create a perfect substitute formulated for your skin type. Each bar of homemade bar soap that we make should last at least twice as long as the store bought bar soap that contains all the chemicals. Home made bar soap costs less in the long run than store bought soap. Making the world a happier, healthier and more fragrant place, one bar at a time.